Revealed today at the The Walt Disney Company Annual Meeting of Shareholders at the Palace of Fine Arts in San Francisco, the film will be written by Chris Weitz (Cinderella, About a Boy, Antz, the Golden Compass) and directed by Gareth Edwards (Monsters, Godzilla). Felicity Jones is already confirmed as cast in this film set to begin production this summer in London. “Rogue One” is scheduled to be released December 16, 2016. Also mentioned today Rian Johnson (Brick, Looper, Breaking Bad) has been tapped to write and direct “Star Wars: Episode VIII.” Kathleen Kennedy and Ram Bergman, producer of Looper and Brick, are set to produce. Episode VIII is scheduled for a release on May 26, 2017, forty years and a day since “Star Wars: A New Hope” first screened. Is Will Ferrell Baseball’s ‘The Natural’?! “Free State of Jones” Star Matthew McConaughey Teaching at the University of Texas? 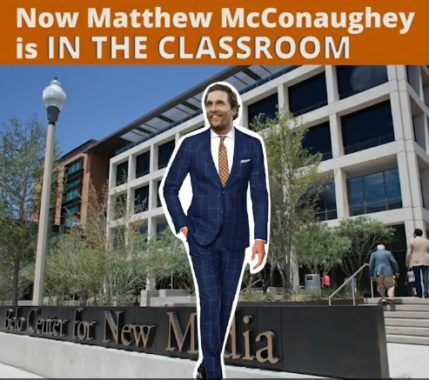 July 5, 2016 Jason Bennett Pop Cult News Comments Off on “Free State of Jones” Star Matthew McConaughey Teaching at the University of Texas?